Well, I got a BIT of work done, took a bit of artisitic license and made the division symbol a bit bigger than they were, just so I could paint the crosses right. Also, the French Flags are a tad bigger, again for ease of painting and such. I added the Resistance guys and some explosives. Colors were green spray, Brown Violet, Ogryn Flash wash, Brown Violet again, then highlighted with Ghoul Skin Green. Makes for a good objective I think. Cavalry Recon Patrol, 1 M8, 2 jeeps, 70 points. (above) Table set up at the CLGS. The terrain is my new desert scenery, so its out of place for LW but what can you do! Mike_A and I scheduled up a game at the store, given that we both work nearby, but we had to get in before it filled up with the Malifaux/Infinity guys apparently. The Magic guys were in the other room. They need a Narnia room like up in Petawawa! Mike is running gorgeous US Para's on KK bases, and I am running my all light armor Beute StuG Abteilung, 1500 points practice for Game Summit which is in 3 weeks. We played Free For All. (above) good thing I brought terrain, because NO JOKE this is what the Infinity ( I think it was that game) was using.. If youre going to use dollar store models, at least paint them! My setup on the left flank meant I was going to initially rush forwards, but all game I was trying to take out the 6 x 105mms, and to the end I couldnt get them below 3 guns. Meanwhile, the real action occured on this hill, where he moved up a unit, I moved up my GPGrens, and in a hideous assault, I pin him, assault, kill 2, he swings back, and I fail 4 of 4 saves, and fall back! He later crushes the rest of them and is now advancing on my LuftWaffe 88's and Panzerwerfers! I had to move assets over from my left flank to MG and direct fire to whittle them down. Here in this pic you can see my horseshoe-of-doom. Not much left now, but I had wiped out one small platoon, he pulled back one, and he had one platoon, so it was as draw going in to the final turns.. The platoon in the town there is going to try and bazooka my one remaining StuG 39H and grab a second platoon kill! Mike, post your list if you read this in the comments below! I know he had roughly engineers, men, men, HMGs, 57mm AT (aka 6pdrs) and his Arty. So I am an idiot. Why am I an idiot? Because I am going to undo about 2 months hard work painting my Late War Brits. When I decided to do my LW Brits in the Italy scheme, It was simply so that I could use already painted models (25 pdrs, 17pdrs, infantry, UC's etc) and simply add a few models, like an AOP, 4 M10s and halftracks to make Motor Platoons. For some reason though I just cant get into it. I won some Grants a while back at a tourney, and was thinking to myself.. do I really need MORE Brit tanks? I already had 9 shermans, 9 Crusaders, 3 Churchills, 4 M10s, plus an entire EW BAR army. Also, I never seemed to use my Priests. Plus I wanted to run a "minor power" also, like Romanians, or Hungarians or some such. What I realized though, with chatting with Scary Biscuits and others over on the WWPD Forums (he works at BF) is that I could run basically a US force, but not have to paint the stupid allied star (AKA the USA star) if I just limited myself a bit.. namely, not running 8 million bazookas in each Inf squad, not using Radio rule, only 1 76mm Sherman per platoon, and run a characterful army. I did some research and the more I read about the French 2eme Division Blindee (2nd Arm'd Div), the more I like it. The fact that they can run Priests is great, I have 4. They can run M10s, which I have 4. They can run bone-stock welded hull shermans galore, which I have. Halftracks I have plenty, I just need to add on the MGs that the Brits dont get. Only problem is right now the list isnt "official" as it still references Operation Cobra for Priest and Stuart pricing. Scary B aka Mike Haught says that it will get updated eventually, but for now I'll just run a generic US list from Fortress Europe, so it is official. The other crazy part is, I am going to try and get it ready for game Summit. 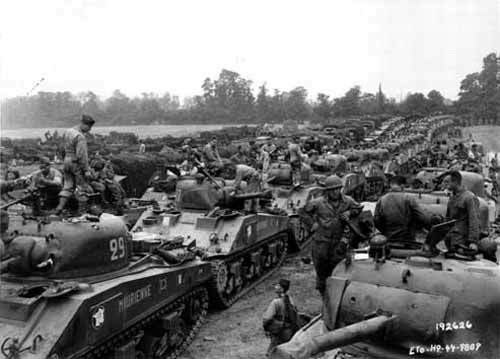 From landing on Normandy to Liberating Paris, the 2eme Div Blindee took 25 days. I have a bit less than that until Game Summit. I drove to Petawawa today to grab what I couldnt find locally, like the Stuarts, who my good friend Marty says to never NOT use. He says everyone should run 17 of them in fact... so I had to get some..
... (above) I also got a Kepi-wearing CO in Charles de Gaulle (the Somua will be a re-recaptured BeutePanzer, that the german police units used to keep the Resistance in check, plus a blister of Resistance dudes (and chicks) Some of em are wearing turtlenecks, berets, and have guns.. how awesome is that? I'm going to intersperse them in my infantry stands to represent them joining their countrymen to clear the Bosche from their land. The Free French had some weird units as well, namely a March Company of Chad, which is basically French Colonials from Chad, Senegal, etc that fought in North Africa, Italy, and now in their home country. This means I can paint one of my Armoured Rifle units with black skin. The officers were still white though, since its still the 1940s after all, but I think the unique markings on the vehicles, the Croix de Lorraine on every helmet and vehicle, and the french flag on shoulders and vehicles will make for a different looking US force at the very least. I got the fancy plastic rubble bases, a rifle co. box set to make Armoured Rifles x2 (hence the halftracks that need repainting in that pic) , so basically, I'll have enough models to run Armoured Rifles, Rifles, or Armoured Div. army. UPDATE I guess I had forgotten to post this last night. All day today I spent organizing my dudes into the 2 Armoured Rifle units, plus adding US crew to all my vehicles. That was this morning, this afternoon, I guled them all to the plastic scenic bases. I noticed that half were rubble, half had cobblestones, so I will split my two units using the different basing schemes. Also, like I mentioned, one of the units is Colonial, so will have coloured troops and white officers!! (above) Re-Captured Somua S35 with Resistance guys in front of it for objective 1, and since I am going from 4 to 3 Priests (Brit org to US org) I figured I'd make an objective out of the spare Priest. I recall seeing in my research a burnt-out vehicle that has "Here lies 3 dead French Soldiers" in an obvious attempt to sway any fence-sitters to rise up against the german occupation of Paris. I will paint that on the side. The Resistance Blister has some dynomite too, so I put those nearby, in case they want to deny this artillery to the germans. (above) to the left is my CO stand, it is Charles de Gaulle model, another french officer, and some messengers in a sidecar. To the right is my 2IC stand, 3 US-uniformed guys and a casualty model. (above) Cobblestone Armored Rifle unit, historically, the French had less Bazookas than the US, and I wanted to be able to field this as a reg US force until the Free French list is offical. So I used standing guys and strapped on some 'looted' weaponry to make up the remaining 'Zookas I needed. Hurray PSC Halftrack box! This unit will be my Colonial Unit, the 'Regiment de Marche du Tchad'. And lastly, this is my second Armored Rifles. Again, 'pre-owned' extra anti-tank weapons so I can run this out of Fortress Europe until such time as the list gets updated. I decided against intermingling my Resistance guys, instead they will remain distinct, or form the extra stands required if I run Rifles instead of Armored, plus Weapons platoon. In the French List they are confident conscripts, 7 stands for 65 points, very nice home obj holders! The black painted stand is my tester stand, which I will paint tomorrow morning. Tomorrow Afternoon I play a game a the CLGS, and then its terrain frenzy for our 28-man tournament. I like how a year ago we had 7 people show up, now its 28 people! New post tomorrow, hopefully a painted stand of dudes done! (above) 1500 points, Spearhead, vs my buddy Alex who is soon leaving to join the Army. Shocking that this isn't Flames of War I know! My buddy Alex (In flames of war locally, he was the first to run SS Tigers.. in Mid War!!) is leaving town, going to Basic, etc, so I figure who else to shake the 40k rust loose against than him. It has been 15 months since I last played any 40k, since I even opened up my case! However, I had a good tournament list in my case, all printed out, so I used that. I forgot quite a lot about 40k, especially that he would be going first, and what a Night Spinner does to Tyrannids. My deployment is below. (above) Turn One and Two he jets stuff into my face, daring me to assault. He also drops a Web template over my hiveguard. TIL that that stuff stays on my models until I move!!!! (above) my Turn 2, my Tyranno's have to kill off the Bright Lance Vypers, who have done 4 wounds to one 'Fex. Somehow I actually hit with my 265 pt beasts and wipe them out! (above) Turn 3 sees the Avatar & Avengers charge into my Gaunt screen. At this point I realize that my Tervigons have a power to give them FNP and so on. 15 months is a while!! (above) after my Fexes take out the weapons from the Prism and Night Spinner, the last unit of Gaunts before my Tervigon crapped out rushes to contest his objective..
.. while the Catalyst Termagaunts hold the Avatar in place until the Prime gets in. twin Boneswords means take a leadership test or die if he fails his 3++ save. Needless to say, he rolled a 12 and died!!! Sadly for Alex, the game goes on, and the Prime is able to carve up the gunless Prism, while it takes all my remainig hive guard to actually kill the gunless Serpent on my own objective. I don't like to have the same army as everyone else. And I like to use Canadian vehicles and troops. So, instead of using Sherman OP tanks, I wanted some Ram OP tanks, which is historically accurate as they were used by the Canadians from D-Day on. BF doesn't make a Ram kangaroo anymore, so I found some on eBay made by Axis and Allies and I was surprised to find out that they were the same size as FOW. Now Ram kangaroos had their turret removed to make room for infantry, so I had to scratchbuild the turrets. I used pink styrofoam insulation, some plastic card and some extra parts from my BF M10's (hatches and gun barrel/mantlet). I thought of doing the real Ram mantlet, but I'm not that skilled, and I figure the Sherman one will do. I will then paint in all the Ram bolts found on the mantlet. If it still looks bad, I'll just add some camouflage netting. Here are the completed Ram kangaroos with the scratchbuilt turrets. The only glue that seem to be able to glue plastic and foam together was Uhu, but it takes forever to dry, so you'll have to wait another day for the painted shot of the turrets. So far, I'm happy with the result. It gives me a unique vehicle that probably no one else out there has. Everytime I go to Denmark I drop by the Tinsoldaten club in Aalborg. Well, this is my second visit. http://www.tinsoldaten.dk/ This visit they decided to play a multi player 3000pt FOWbattle. The photo above shows the town square across from the train station at 0900hrs (thats in the morning, not at night) on December 28, which shows you how little daylight there is in northern Europe in the winter. This isn't the battlefield, its one of the train layouts that they have in every major train station in Denmark. Here is the battlefield. Germans on the left, Allies on the right. WW2 Bunkers from the west coast of Denmark. It might have been by accident but the three guys with the English sounding first names played the guys with the Danish/German first names. The guys were really great and declared that the game would be played in English. This wasnt a big problem for them as they all spoke and understood English very well. Plus, their rulebooks came in English.